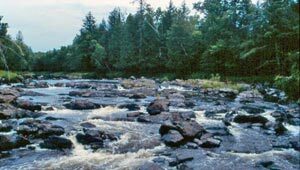 This National Wild and Scenic River lies within Ottawa National Forest on the extreme western end of Michigan's Upper Peninsula. Each year tens of thousands of recreationists descend on the Black River region: to fish the miles of quality trout water, canoe in the river, hike the North Country National Scenic Trail, or tie up their boats in Lake Superior's Black River Harbor, one of only two safe harbors within the National Forest system. For many years the Forest Service has been seeking to protect 776 acres along the river that remained in private hands when the forest was formed—land that offered not only abundant recreation but was also a popular travel corridor for native timber wolves. In 2001, TPL used money from its Northwoods Land Protection Fund to purchase and hold the property until the federal funds were available.